product range under the brand name iBoardTouch supplying products through distributors and a channel of international reseller partners. iBT’s strategy is to develop exciting, intuitive and easy–to-use technology that educators most want to use. The iBoardTouch solution makes teaching with tech easy and exciting – students and teachers love the enticing large bright touch display screen, which has everyone up and interacting. Educational organisations today are seeing the benefit of replacing their classroom whiteboard and projector systems with innovative large-format interactive touch display technology. British technology brand iBoardTouch (iBT) is leading the way in providing a range of superb interactive hardware and software solutions specically for classroom and learning environments. You can also quickly create a pop-up classroom in any internal space by pairing your screen with a mobile mounting solution – just plug and play for instant classroom activity. 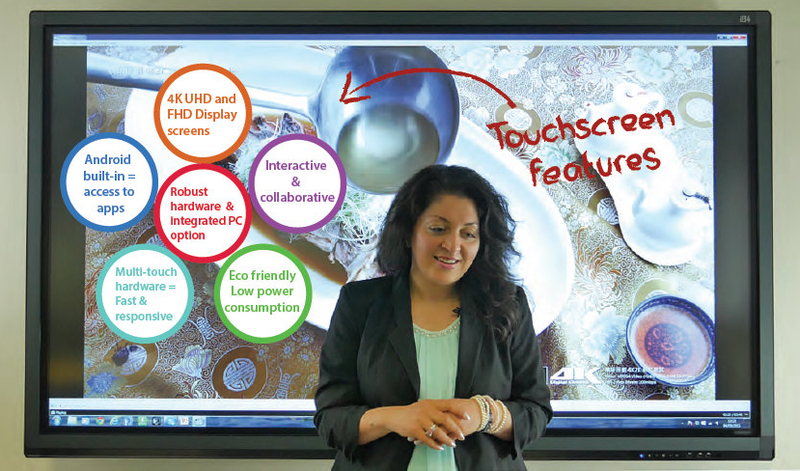 The V+ range of interactive touch displays is available in a variety of sizes to suit your space and budget. iBT offer free no obligation interactive touchscreen demonstrations in the comfort of your own classroom or learning space. Call us and book a demo and we’ll bring a 55-inch interactive touchscreen to you on a mobile stand – we’ll show you the features and functions and give you time to ask questions and try the system yourself.